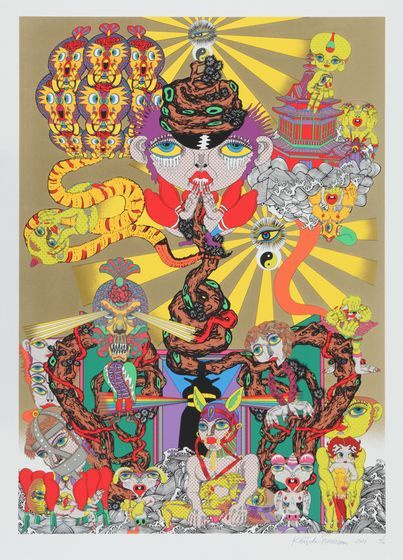 AZITO is pleased to introduce new artworks by Keiichi Tanaami. When I visited Tanaami’s exhibition in the end of October, these vivid colors jumped into my eyes standing out from the bright white gallery space. 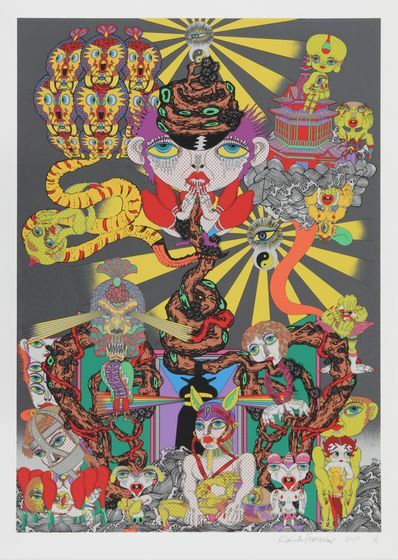 I love Tanaami’s strong coloration and these prints were just as strong as his painting. Moreover, Tanaami is now 75 year old. I respect the energy creating such a powerful artworks at his age. As you can see in the title of the work, “bridge” was the main theme of the exhibition. 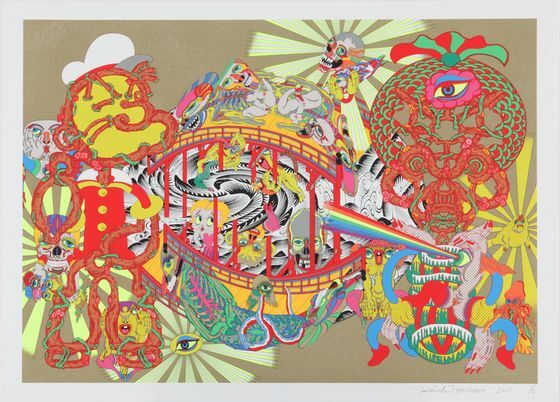 For Tanaami, bridge was a place strongly connected with death. He saw dead bodies along he bridge during a nighttime air raid in WWII when he was 9 year old. In a movie, the severed was hung along the bridge, dead bodies were hidden under the bridge and brooding lovers threw themselves from railing in miserable double suicides. Bridge was always related with death and Tanaami thought it is cultural feature of bridge in Japan. Tanaami, himself has experienced the fear of death through war and heavy disease. During the war, he saw the light from the bombs reflected off the scale of grandfather’s goldfish. 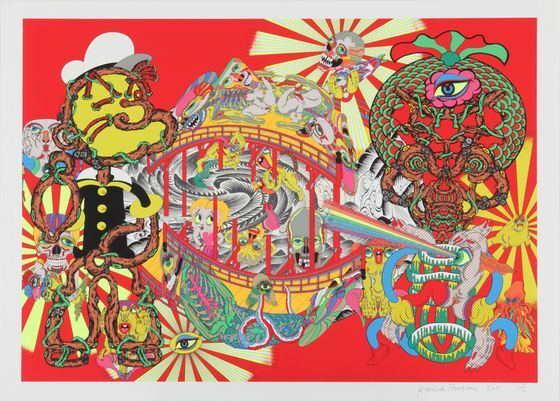 Pine trees, seemingly pregnant with skull and Popeye forms , are based on hallucinations Tanaami witnessed when he nearly died from a pulminary edema at age 44. During his illness, for more than a week he suffered nightmares about pine trees tightening around him. These motifs are seen in his artworks too. The galleriest, Nanzuka told me that when he tried to show Tanaami the photos he took in the Tohoku area damaged by the 311 earthquake and tsunami, Tanaami refused to see them. The photo reminds him of what he saw during the war since the view was too similar to it. After Tanaami had came back from place of wartime evacuation, there was literally nothing remaining in the town and the view was completely changed. Flat horizon and blue sky were just existing there. He may be still in the middle of trauma. There are many artists dealing with the theme of death. 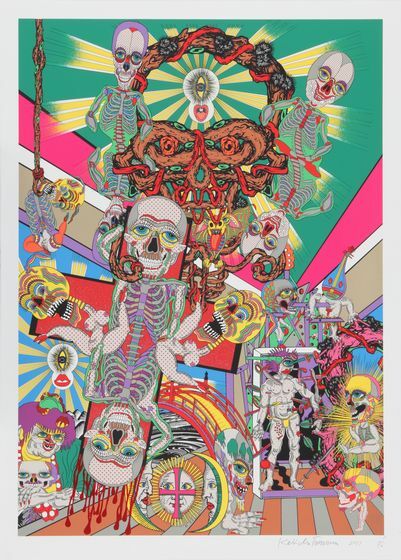 While some artists focus on emotional part of death, like fear and sadness, for me, Tanaami’s expression is focusing on the energy of death. The energy of fighting against the death.